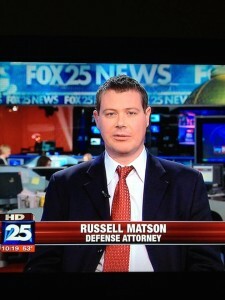 Russell J Matson is the founding attorney at the Law Offices of Russell J. Matson, PC, a Massachusetts criminal defense law firm. He has been representing clients in criminal cases for 20 years and has appeared in every district court in Massachusetts representing clients accused of misdemeanor and felony criminal charges. He has been quoted in countless local and national media outlets, including the Boston Globe, boston.com, Boston Herald, Patriot Ledger, Fox 25 News, WHDH Channel 7 News, Channel 5 News, and many more. 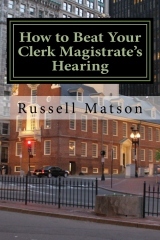 He wrote the book on winning Clerk Magistrate’s Hearings. There are a number of important things to consider when looking for an attorney to represent you in a criminal case. Reputation, experience, and results in similar cases to yours are all certainly important. Yes, I’ve been on TV, and been quoted in lots of local media, but those things ultimately aren’t that important. When hiring a criminal defense lawyer, you should also strongly consider whether or not you feel comfortable with your attorney. That you feel he is listening to your concerns, answering all your questions, is generally easy to deal with, and someone with whom you are confident in on your side. Going through any criminal court proceedings, no matter how minor, can be incredibly stressful. It is not a situation you ever expected to find yourself faced with. Whatever penalties you may face, even just working through probation terms, can be overwhelming. Sometimes it is hard to process all of the new information you have to juggle. Is the judge going to be mad at me? If I say the wrong thing to the wrong person, will it hurt my case? You want to have an attorney who is calm, helpful, and in control of the situation. That’s what you are paying him for, along with his legal expertise, of course. You may ask the same questions 3 or 4 times in different ways. I understand. That is how people process information in stressful situations. The best thing I can do for my clients is often to calm them down, get them to relax a little bit, and explain that a criminal charge is not the end of the world. We’ll deal with the courts as quickly and efficiently as we can. Hopefully, it will be quick and relatively painless. There really are lots of charges that I can beat outright, and that can completely go away. In other cases, we can fight to work out a plea deal that you can live with, and get on with your life. If you are looking for a Massachusetts criminal defense lawyer, give me a call, and I will tell you exactly what I can do to get you through this problem. For a free consultation on any criminal charge, you face, call (781)817-6332, or fill out the form below.